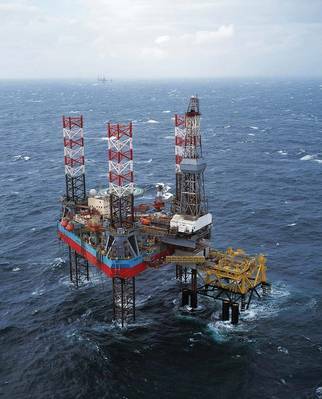 The offshore energy sector, like any industry, is constantly subject to market cycles. Challenging conditions may lower demand, resulting in a significant number of resources such as offshore support vessels (OSVs) and drillships being deactivated for potentially extended periods. Over time, however, cycles reverse and demand increases for these same assets. Operators reduced expenditures on offshore exploration and production activities, with a subsequent lower demand for these offshore assets, many of which were ultimately deactivated and laid-up (or “stacked”) for extended periods. While not an ideal status, lay-up is a proven cost saving alternative in situations where charter rates are below vessel operating cost and provides an option that owners can use for short or long-term financial respite. More recently, however, 2018 has seen an upturn in production as oil prices have risen. While exploration activity has not directly mirrored this trend, the establishment of new supply chain contracting models, along with new standards for efficiency established by the operators, generates optimism that 2019 will continue the trend of slow but steady growth within the offshore sector as it lays the foundations for a longer-term resurgence. Buoyed by this optimism and a tangible increase in oil prices, deepwater drilling is making a comeback. With the price of oil relatively steady above $60 a barrel and natural gas projected to provide 45% of power generation by 2040, drilling rigs are coming out of lay-up to meet the market’s demand. As a result of a positive forecast for the future of the industry, vessel operators are beginning to reactivate idle OSVs as the demand for their services climbs in conjunction with the increased use of drilling assets. All of these assets and vessels are extremely specialized, performing distinctive industrial missions with varying degrees of risk including drilling, manned diving, ROV, and subsea construction operations. With very few exceptions, these functions are performed by complex platforms incorporating dynamic positioning (DP) technology. When contracted for active service, these assets were subject to a high level of technical scrutiny that provided assurance to all stakeholders that they could execute their missions safely and reliably. Working against tough markets, with owners and operators subject to time and financial constraints, thorough lay-up preparation and maintenance was generally not subject to a comparable level of guarantee. Nevertheless, the reactivation of assets safely, reliably, and efficiently remains critical, regardless of stacking procedures and maintenance activities that may (or may not) have taken place. Clients and other stakeholders demand a level of assurance that an asset will continue to operate as effectively and efficiently as it did before lay-up. In anticipation of these demands, MAC and Bureau Veritas have been active in the development of guidance and recommended practices to verify that reactivation has been addressed properly. MAC has been directly involved with The Marine Technology Society in developing The DP Asset Reactivation Guidance and has supported Bureau Veritas in the development of Guidance Note NI 649 DT R00 E, Guidance for the Lay-Up and Reactivation of DP Vessels. Both guidance documents are designed to support the efficient return of DP assets to service and to provide a clear path toward the safe and reliable reactivation of DP capable assets, emphasizing the positive influence of adequate preparation on safety and operational reliability. With the understanding that proper planning and execution are critical to achieving the goal of the effective return of the asset to service, this guidance outlines a number of factors that should be considered as part of the overall strategy for asset reactivation. The specific focus on DP related systems and equipment is reflective of its criticality for safe offshore operations. Dynamic positioning capability is not only instrumental in the execution of the respective industrial missions of each asset, but also critical for safeguarding against incidents. While technology in general plays a crucial role in asset reactivation and DP operations, there are several additional important aspects that are addressed in these guidance documents including environmental considerations, documentation and regulatory concerns. Importantly, in preparation for reactivation it is recommended to use the same personnel that were present for the lay-up activities, to ensure continuity of information and experience. Unfortunately, given the potential trajectory of the industry and its recovery, this may very well surpass reactivation of the physical systems and equipment as the biggest challenge an owner – and the industry at large – will face. As more vessels are brought back into service after lay-up, DP systems will need to be renewed, retested and recertified. Many operators will need DP refresher training, familiarization and, in some cases, recertification to ensure they are competent to operate these systems. As a consequence of the downturn, a significant proportion of personnel has moved on to other seemingly more stable sectors, taking their skills, knowledge and expertise with them. Attracting them back or encouraging others to join is going to be an industry-wide challenge. Additionally, an often ignored aspect, the loss of onshore personnel must be taken into account to ensure adequate supporting resources are available across the varying disciplines, with a particular focus on operational and engineering experts needed for the reactivation plan and execution period. 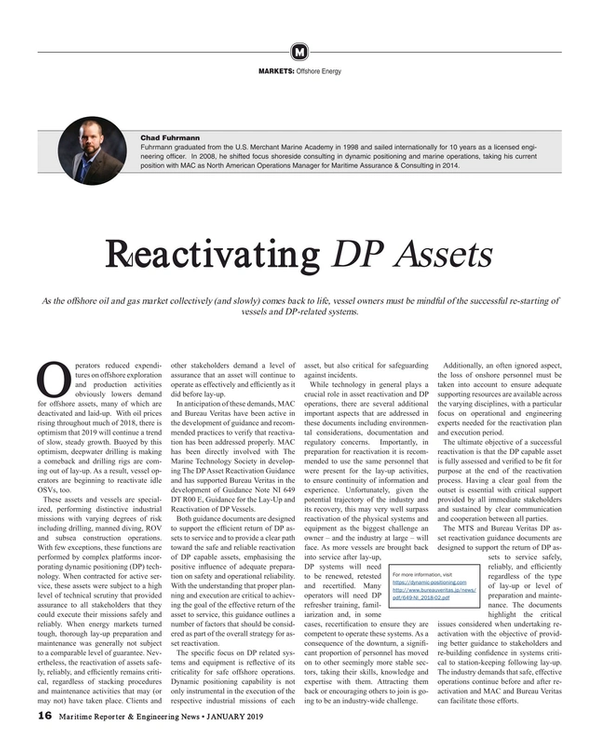 The ultimate objective of a successful reactivation is that the DP capable asset is fully assessed and verified to be fit for purpose at the end of the reactivation process. Having a clear goal from the outset is essential with critical support provided by all immediate stakeholders and sustained by clear communication and cooperation between all parties. The MTS and Bureau Veritas DP asset reactivation guidance documents are designed to support the return of DP assets to service safely, reliably, and efficiently regardless of the type of lay-up or level of preparation and maintenance. The documents highlight the critical issues considered when undertaking reactivation with the objective of providing better guidance to stakeholders and re-building confidence in systems critical to station-keeping following lay-up. The industry demands that safe, effective operations continue before and after reactivation and MAC and Bureau Veritas can facilitate those efforts. The Author, Chad FuhrmannFuhrmann graduated from the U.S. Merchant Marine Academy in 1998 and sailed internationally for 10 years as a licensed engineering officer. 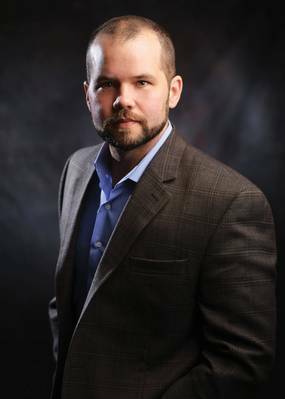 In 2008, he shifted focus shoreside consulting in dynamic positioning and marine operations, taking his current position with MAC in 2014. As the North American Operations Manager for Maritime Assurance & Consulting, Chad guides the company’s commercial strategies in the region in providing innovative methods of integrity assurance.Including service as an appointed member of the National Offshore Safety Advisory Committee, Chad volunteers his time with industry groups acting as an adviser to the US Coast Guard and IMCA in the analysis of MSC Circular 1580 – Guidelines for Vessels and Units with Dynamic Positioning (DP) Systems. Chad is active in the MTS DP Committee, serving as the Chair of the DP Equipment Testing Subcommittee which generated the DP Asset Reactivation Guidance. He recently leveraged that experience by participating in IMCA’s Working Group on DP Vessel Reactivation.